You are here: Home / All / NLP applications / What are the ‘Presuppositions of NLP’? This article is about what are called the ‘Presuppositions of NLP’ – in other words, what you have to assume or ‘presuppose’ to be true in order to be able to use NLP and make it work for you. We might call them principles of NLP, except that would imply that they actually are true, or some kind of beliefs that we expect you to take on trust. In NLP, remember, we’re not concerned about making generalisations about what is true or not; we’re concerned with what works and what is useful. We’re not asking you to believe these presuppositions as articles of faith; we’re asking you to act as if they are true in order to make NLP work for you, and you’ll start generating your own evidence for yourself that they work. I’ve had participants on my NLP Practitioner courses tell me that applying maybe just one of these presuppositions has made a massive difference in their lives. In every book you read about NLP, you’ll find a slightly different list of these presuppositions – they’re all saying the same thing in different ways. The reason you get differing formulations is perhaps because as far as I know, Bandler and Grinder didn’t set down all of them, so there hasn’t been a definitive set handed down by the originators of NLP. Some versions of the presuppositions were formulated by people they trained and worked with, such as Robert Dilts. 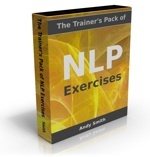 And, of course, every NLP trainer wants to get the presuppositions across in the way that will work for their students, so you find many slightly different versions – all expressing the same basic ideas. I should point out that the word ‘presupposition’ also has a broader meaning in NLP, covering anything that’s presupposed in a question or statement. For example, in the classic sales closing question ‘Would you like to pay by cash or card?’ presupposes that you are going to buy, even though it doesn’t explicitly say that. If you go for either of the two choices on offer, ‘cash’ or ‘card’, you’ve already accepted the presupposition. Later on we’ll look at presuppositions in language in depth. In the set of signature language patterns and accompanying questions known as the Meta Model, we’ll learn how to discover and flush out hidden presuppositions. In the mirror-image set of language patterns called the Milton Model, we’ll learn how to deliberately use presuppositions to structure and sequence internal representations in the listener’s mind – which, guess what, is exactly what I’ve been doing all through this blog. If that sounds manipulative, it’s OK; everyone structures and sequences internal representations in the listener’s mind every time they open their mouth. It’s just that with NLP we can become aware of the presuppositions in our own language so we can become better communicators.